The agenda for tonight’s regular LBSUD Board meeting (Tuesday, Sept 11) has been posted online here. Open session will begin at 6 p.m. The Board will receive a presentation regarding the district’s No Place for Hate designation. Action items include routine business and policy items. Please note the following change for the calendar agenda item: At the last Board meeting on August 21, the Board directed staff to bring calendar action items to the Board at its next regular meeting on September 11. Since that meeting, it has come to the Board’s attention that not all Board members will be able to attend the September 11 meeting. Since this topic has been carefully studied by the Board over the last six months, it is important that all Board members are present when considering action on the 2019-2020 and 2020-2021 school calendars. Therefore, the action item will be considered at the following regular meeting on Tuesday, Sept 25 at 6 p.m. in the District Office Board room. Jason Fritze, a Spanish elementary school teacher, was named the recipient of the 2018 Spirit of Laguna award on August 28. Superintendent of Schools Dr. Jason Viloria presented the award at the annual Welcome Back Breakfast for Laguna Beach Unified School District employees. Now in its 11th year, the award recognizes a District staff member who exemplifies extraordinary service to others. “The energy and passion that Señor Fritze displays in teaching his students Spanish make his classroom a favorite of mine to visit,” said El Morro Elementary School Principal Chris Duddy. “You won’t see children completing grammar worksheets. Instead, you’ll find them physically and mentally immersed in speaking and reading Spanish. I’m never surprised to find Spanish instructors from around the world visiting his classroom to observe his teaching strategies,” he concluded. Mr. Fritze is a National Board Certified Teacher in World Languages Other than English, an author, and a presenter. Originally from Oklahoma where he taught Spanish and French for seven years, he has also taught in New Jersey and Tennessee. He regularly presents at state, regional, and national language conferences and conducts workshops for language teachers throughout the United States on Comprehension-Based Methods and reading strategies in the classroom. “Jason is a worldwide leader in foreign language instruction, and we are lucky to have him as part of the LBUSD family,” said Top of the World Elementary Principal Michael Conlon. Mr. Fritze has taught in the Laguna Beach Unified School District since 2009, alternating his time between El Morro Elementary and Top of the World Elementary. The creative learning environments he creates for students regardless of age or ability and his continued efforts to share his knowledge with peers are evidence of his commitment to his students and profession. Laguna Beach PTA Coffee Talk (formerly known as Coffee Break) has announced its 2018-19 schedule. The series features programming organized and supported by the Laguna Beach PTA Council’s Parent Education Committee. The series is usually (but not always) held on Wednesday mornings and features a guest speaker – local professional parents, invited ‘out of town’ speakers and some internationally renowned speakers – who present a topic that is relevant to parents, guardians and mentors. The series will kick off on Wednesday, Sept 19 with a “Back To School Report,” presented by LBUSD Superintendent Dr. Jason Viloria and district staff, who will update the community on the strengths of our schools, progress that has been made, and expectations for the future. 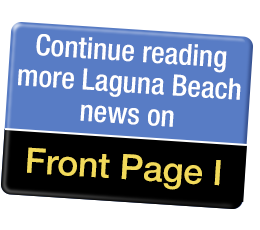 The event will be held at Laguna Beach City Hall in the Council Chambers from 8:30 - 10 a.m. It is free to PTA members and $10 for non-members. To RSVP, click here. On Wednesday, Oct 3, the PTA will host a “New Family Welcome Tea.” This is a chance for new parents to meet other families in the district and learn more about our community. Longtime residents are welcome to join and help welcome the new families. The event is from 8:30 - 10 a.m.; the location is TBD. On Wednesday, Oct 17, special guest speaker Tyler Durman will discuss the “Four things to deepen respect, avoid rebellion, and enjoy more laughter around the table.” The event is from 8:30 - 10 a.m. and will be held at Seven 7 Seven, 777 Laguna Canyon Rd. The following talk will be on Wednesday, Nov 14 from 8:30 - 10 a.m. Featured guest speaker Richard Watt, author of “Entitlemania: How Not to Spoil Your Kids, and What to Do If You Have,” will speak about entitlement and how to avoid supporting it as a parent. The event will be held at Seven 7 Seven, 777 Laguna Canyon Rd. Starting the new year on Wednesday, Jan 16, 2019 from 6:30 - 7:30 p.m., Jess Hopkins will present “How to handle gossiping, bullying, and intentional excluding.” The event is intended for parents and children ages 13 and older. The location is TBD. Then on Wednesday, March 20, 2019 from 8:30 - 10 a.m., Cyberwise.org will offer a presentation on “Keeping kids safe online.” The event will be held at Seven 7 Seven, 777 Laguna Canyon Rd, and is intended for adults only. Coffee Talk is open to all parents, LBUSD personnel and the public. Admission to the talks is free for PTA members and typically includes coffee, tea, bagels, and pastries. For more information, visit www.ptacoffeetalk.org. LBHS Football seeks its second win tonight at home against Dana Hills – come give a cheer! Laguna Beach High School Football (1-1) seeks its second win of the season tonight at home against Dana Hill Hills School. Dana Hills is 2-1 thus far, and is ranked #793 in the state according to Maxpreps.com, while Laguna is ranked #628, setting up for a competitive and evenly-matched game. Laguna is coming off a tough loss last Friday to start the season against Big Bear, despite banner performances by Junior Quarterback Andrew Johnson, who threw for 4 TDs and earned a near-perfect 141.1 QB rating, and Senior Wide Receiver Sean Nolan, who caught for 146 yards. Tonight’s game kicks off at 7 p.m. at Guyer Field. There will be food trucks beforehand again too, so bring the family out and come give our boys a cheer! The Laguna Beach Boys and Girls Cross Country teams kicked off their seasons on Saturday, Sept 1 at the 12th Annual Great Cow Race at Cerritos Regional Park. LB Girls finished 14th overall out of 33 teams, ahead of schools two, three and even four times our size, like Huntington Beach, Torrance, and Poly (Long Beach). In fact, the only Southern Section Division 4 team that placed above Laguna was Bishop Amat. Senior Emily Engel led the way, finishing 56th (out of 838 total runners) with a 3-mile time of 19:33.0. Junior Kaitlin Ryan finished just a few strides behind in 74th place with a time of 19:48.8, while Freshman Coco Reed also finished strong in 122nd place with a time of 20:21.4. LB Boys finished 26th overall out of 34 teams. Top finishers individually included Sophomore Will Compton in 127th place (out of 1,075 total runners) with a time of 16:47.4, Timmy Crawford in 215th place with a time of 17:14.2, and Junior Tanner Burton in 271st place with a time of 17:33.6. Congrats on a nice start to the season for both teams! That was the story on Friday night when Laguna Beach High School Football (1-1) lost a heartbreaker to Big Bear at home, despite outscoring the visiting Grizzlies in the first and fourth quarters (6-0 and 14-7) and staging a last-minute touchdown drive to end the game and pull within three. Big Bear, last year’s CIF Southern Section Division 12 Champion (three divisions tougher than Laguna’s), has no underclassmen on its varsity roster according to Maxpreps.com. On the defensive side, Connor Fink, Caleb Mostajo and Jake Harper stepped up big for the team also, as did Nolan and Lythgoe, who play both sides of the field. Despite the loss, Laguna moved up almost 100 spots in the California state rankings to #628 (up from #712 last week before the game). Laguna looks to rebound on Friday night against Dana Hills High School (2-1) in another non-conference game, again at home. The MY HERO PROJECT honors local and global heroes with Music, Art, and Short Films. Laguna Beach High School student Whitney Winefordner performed an original song, MY BLUE HEART, which she co-wrote with Janet Bartucciotto and Emily Morris, to celebrate oceanographer Sylvia Earle at the 2018 Laguna Hero Fest. Winefordner, accompanied by high school pianist Larsen McCarroll, received a standing ovation at the Hero Fest, which is sponsored by the City of Laguna Beach with support from the lodging establishments. Learn more at www.myhero.com/laguna. At the request of MY HERO, the musicians recorded the song under the supervision of recording artist and musician Steve Wood. “We are pleased and proud to share Winefordner’s performance of MY BLUE HEART, on the occasion of “Her Deepness” Sylvia Earle’s 83rd birthday https://myhero.com/my-blue-heart-2,” the organization writes. Whitney’s hope is that, someday, she will get to perform MY BLUE HEART for Sylvia Earle. To learn more about Sylvia Earle’s ocean conservation mission, visit https://mission-blue.org. Each year, The MY HERO International Film Festival offers the Sylvia Earle Ocean Conservation Award (www.myhero.com/earle), presented by Barbara, Greg, Meghan and Shaun MacGillivray’s One World One Ocean Campaign (www.oneworldocean.com). The award honors a filmmaker who calls attention to heroes working for the benefit of the world’s oceans and includes a generous cash prize. Submit your short films here. Laguna Beach Girls Golf (1-2) won a big match at home on Tuesday, defeating Samueli Academy by over 60 strokes, 221 to 289. Junior Kennedy Roller led the way at 41, with Senior Sarah Hollinshead finishing just one stroke behind at 42. The next day, on Wednesday, the team traveled to Tustin Ranch to face Crean Lutheran, and struggled some, according to Coach Jon Hendrickson. “First of all, I want to stress to all players and parents that golf is HARD. It is a tough sport to master and one that we are all trying to get better at each and every day. Measuring one’s ability against another is never a recipe for success. We should be measuring ourselves against the golf course and against our own ability,” he said on the team’s website. (1) Jaden (Shalala) played as a freshman in her first varsity match, shot a 56, and never had to pick up. Finished every hole. (2) Kennedy (Roller) birdied hole #3 and was our medalist again with a 51. (3) Maya (Vidas) pumped a driver over 200 yards. (4) Kenya (Ripley-Dunlap) stepped up and drilled her tee shot to 10 feet. (5) Gigi (DiMond) was only 11 over with 2 holes to play. (6) Claire (Smithers) hit a great tee shot on a long par 3. LBHS Football seeks another win against Big Bear tonight at home – come give a cheer! Laguna Beach High School Football (1-0) seeks its second consecutive win to start the 2018-19 season tonight at home against Big Bear High School. Big Bear is 2-0 thus far, and ranked #283 in the state according to Maxpreps.com (Laguna is ranked #712). Laguna is coming off a big win last Friday to start the season against Hoover High School, in which Junior Quarterback Andrew Johnson threw for 194 yards on 16-31 passing, including 4 TDs, which earned him an impressive QB rating of 133.9 on the game.